"Rescuers are continuing to dig through the rubble of collapsed buildings on the Indonesian island of Sumatra, several days after a deadly earthquake struck the region, but officials say hopes of finding survivors alive are rapidly diminishing." "Only a handful of survivors had been pulled from the rubble by Saturday, three days since the 7.6 magnitude quake toppled tens of thousands of buildings in the coastal town of Padang and surrounding villages. "Up to 4,000 people are believed to be trapped under the rubble following Wednesday's earthquake, the United Nations estimates. Bob, a New Zealander, is head of the Indonesia delegation of the International Federation of the Red Cross and Red Crescent Society. He writes, "I am a wayfarer whose life is packed with disasters, mountains, family, work, writing and books. Currently I am working in the Tsunami and earthquake operation in Indonesia...." A Wikipedia article provides more background. Wayne Ulrich returned one and a half hours ago from a seven hour aerial assessment of the remote parts of the earthquake affected region. An experienced campaigner who has seen many civil wars in Africa for MSF, the Tsunami for CARE described what he saw today in the remote hills and valleys of the greater Padang area as like seeing the effects of an Atomic bomb being dropped on a huge region. He reported houses, mosques, clinics and schools flattened, and on hilly spurs, villages wiped out by landslides. When they landed in villages people walked about dazed not knowing whether to laugh or cry. No medical help visible as being walked about injured or sick. "Flew with Colin Tuck and PMI colleagues to inspect affected villages. What devastation ! I spend time with one elderly woman with a broken back and a large gash in her arm. Tuckey went back to the helicopter and got the firs aid kit and we dresses her room. I will write about that later. Came back after 3 hours and then two planes with shelter materials arrived from Australia. We are moving relief supplies out quickly and the medical and rescue teams continue their work." "It's almost 2 am on Sunday morning. Yesterday, Saturday 3 October is one of those days etched in my life and brain forever. "I nabbed 4 hours sleep last night and woke up restless thinking of all those people trapped under buildings in Padang, perhaps 2000 of them. who knows. I awoke about 5.30 am, had breakfast with Pak Irman from the Indonesian Red Cross (PMI) and then went walkabout alone. . . . .
"I WALK FOR AN HOUR SEEING DEATH AND DESTRUCTION. THANK GOD THE SWISS RED CROSS/GOVERNMENT TEAM HAVE WORKED THROUGH THE NIGHT WITH THEIR LOCATER DOGS AND SEEM OPTIMISTIC. Red Cross people from 8 countries have come to help. We are starting to get on top of the relief phase but a huge task ahead of us. I have ordered another helicopter today so the PMI medical people can get out to those villages cut off and make sure people don't die of injuries and infection. Juggling priorities is difficult." "We live about four or five miles from the centre of Padang. Our house was built around 1975. Older houses like this are much stronger and the amount of structural damage where we are is minimal. It's the newer buildings in town that have had the biggest damage." "In the whole of Padang, 30% of the houses were completely destroyed and of those still standing 80% are damaged and may have to be demolished later on. "Our building was still standing, though it was tilted over to one side. There was no electricity and I found a complete mess inside. I grabbed some clothes and other essentials and went back to the car. "I wanted to spend the night in a hotel, but most hotels were destroyed. The biggest one was still standing, but it was closed. That was lucky, because that same hotel collapsed during the aftershock today." "It is interesting to note that in all three of the large earthquakes upon which I have worked (1999 Taiwan, 2005 Pakistan, 2008 China), the media has tended to initially focus their coverage upon urban areas, whilst the real story has actually been in the rural hinterland. . . . the main reason is of course that in upland rural areas landslides kill large numbers of people whilst also destroying communications links and power infrastructure. Thus, the disaster in these areas goes unreported for some time; even the government is often unaware of this situation. As I tell my students, in this case no news is definitely bad news - if no information is coming out about these upland rural areas then the situation is probably dire." 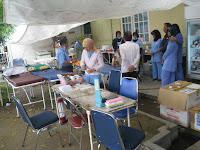 Includes videos of the earthquake, reactions from Indonesian bloggers.